When showing my astonishment the Chinese looked at me not understanding my astonishment. They were convinced that being connected to their cultural roots is a self-evidence. Two weeks ago I talked to a Chinese woman who finished her IT-study and who had decided to earn her income not by working as an IT-specialist but by painting. Of course she had been busy as an artist for ……………quite a lot of years and she had earned already some money by painting while studying. She is not a famous painter but her painting convinced me by their direct and sensible and picturesque manner to cover ancient Chinese issues, traditional views by painting in a modern way. She’s convinced that following her career as an artist gives her the chance, as she called it, to enjoy her traditional, Chinese culture. She does not only feel connected to her culture, but she enjoys. The same time she lives her modern live in Germany, goes to a Rock-Concert or stays or lives in a Non-Chinese country, so still feeling rooted in China. What struck me most was her conviction that painting with traditional Chinese motives, done in a modern way, will of course have an impressing increase in value. 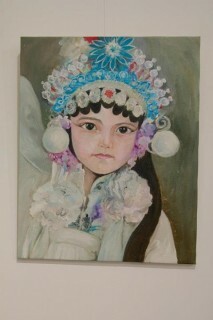 This increase in value she believes will happen because of the traditional Chinese motives painted in a modern way. She enjoyed painting those motives. She enjoys talking about this and she enjoys to let others join her conviction and happiness. Why do I tell you this? It is just easy to explain: Paintings are objects, objectives. Paintings are non-verbal objectives so they are important parts of self expression and thus nonverbal communication. It is also a challenge to take this as part of intercultural communication. I also tell you this little experience because it shows some connected thinking which I often experience with Chinese: it`s the connected thinking of personal development in modern times and modern societies on a traditional background, on a tradition base. Both is necessary to develop oneself. Both seems to be necessary to develop as culture. How do we in western countries live with this? How do we understand change, development and the connected thinking of traditional and modern times?